Modesto CA – At 2:41 AM Saturday morning (3/2/19), deputies were dispatched to the intersection of Chicago Avenue and Alcamo Avenue in Modesto for a report of a person who was struck by a vehicle. As deputies arrived on scene, they found O’Shea Mauldin (23- Modesto) unconscious and it appeared that she had been struck by a vehicle. Mauldin was transported to a local hospital where she died of her injuries. 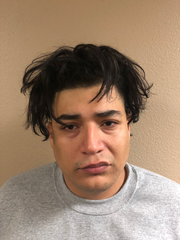 Deputies spoke to another female victim at the scene who told them that a man named Raymond Gutierrez (29- Modesto) had assaulted her with an electronic stun device and had then struck Mauldin with his vehicle before leaving the scene. The victim gave a description of the vehicle and told deputies that she believed that Gutierrez lived at an address on the 900 block of Briggs Avenue in Modesto. Deputies responded to the address on Briggs and located the suspect vehicle and took Gutierrez into custody. Detectives were called out to the scene to conduct the investigation. During the course of the investigation, detectives learned that Gutierrez, Mauldin and the other female victim had been involved in an argument at a Modesto bar approximately an hour prior to the assault. Gutierrez went to Chicago/Alcamo to confront Mauldin and the other victim. The argument turned physical between all three parties. As Gutierrez attempted to flee the scene in his vehicle, he struck and killed Mauldin. Gutierrez was booked at the Public Safety Center for violation of 192(a) PC (Voluntary Manslaughter) and 245(a)(1) PC (Assault with a Deadly Weapon). If anyone has additional information regarding this case, they are encouraged to call Detective M. Silva at 209-525-7091.